Nanoprobes are a nanoparticle research collaborative, striving to engineer the most sensitive reagents and nanotechnology for detecting biological molecules. Using gold labels for sensitive and rapid medical diagnostics, Nanoprobes offer a range of reagents for chemical amplification, staining and imaging. Nanogold® probes have been cited in over 250 publications, and are used in the laboratories of several Nobel Laureates. For the latest in detection technology and reagents, look to Nanoprobes. AuroVist™ 15 nm: Gold Blood Pool X-ray Contrast Agent is the highest contrast of any blood pool contrast agent and has the longest blood residence of any x-ray contrast agent available. Laura Nebuloni, Gisela A. Kuhn, Ralph Müller. A Comparative Analysis of Water-Soluble and Blood-Pool Contrast Agents for in vivo Vascular Imaging with Micro-CT. Academic Radiology 2013; 20:1247–1255. Unlike colloidal gold probes which can only be adsorbed onto proteins, The 1.4 nm Nanogold® particle covalently reacts at specific sites under mild buffer conditions. As a result, the Nanogold conjugate has excellent stability compared to colloidal gold-antibody preparations. It is the first probe offered as a Fab’ conjugate, making it the smallest gold-antibody probe commercially available. These substantially smaller probes reach more antigens and provide better labelling. The Nanogold conjugates can be viewed directly in transmission electron microscopy without silver enhancement. Alternatively, they can be developed with silver to any appropriate size for enhanced visibility with other counterstains. The smallest commercially available gold immunoprobes. Penetrates and reaches antigens inaccessible to other probes: proven penetration up to 40 µm into cells and tissue sections. Extremely uniform 1.4 nm diameter gold label. Fab’, IgG and Streptavidin conjugates available. Close to 1 Nanogold®particle to 1 Fab’ (or IgG). Low non-specific affinity gives minimal background. Ultra-sensitivity with silver enhancement: 0.1 pg of antigen detection on immunoblots. Gold is covalently attached to antibody remote from antigen binding region. High stability and long shelf life: conjugates show unchanged reactivity after storage for a year. Stable to a wide range of pH and ionic strengths. With a combined fluorescent label and the Nanogold® gold nanoparticle, label the same sample for both confocal and EM in just one step. Cheutin, T.; Sauvage, C.; Tchélidzé, P, O’Donohue, M. F.; Kaplan, H.; Beorchia, A., and Ploton, D.: Visualizing macromolecules with FluoroNanogold: from photon microscopy to electron tomography. Methods Cell Biol., 79, 559–574 (2007). Each lipid molecule is covalently linked to a Nanogold® or undecagold cluster through its polar head group. Since the gold moiety is hydrophilic, these molecules retain the amphiphilic nature of the parent lipid, and behave like fatty acids or phospholipids. Study membranes by incorporation into the lipid phase, or gold-label micelles and vesicles so that they can be identified and visualized. Discrete single molecules with one lipid to one gold cluster label. Covalent attachment ensures consistent structure and properties. Soluble in organic solvents and alcohols for easy incorporation into liposomes. Gold is the new silver! Silver enhancement has long been used by microscopists to better visualize gold labeling, especially when using small gold particles. 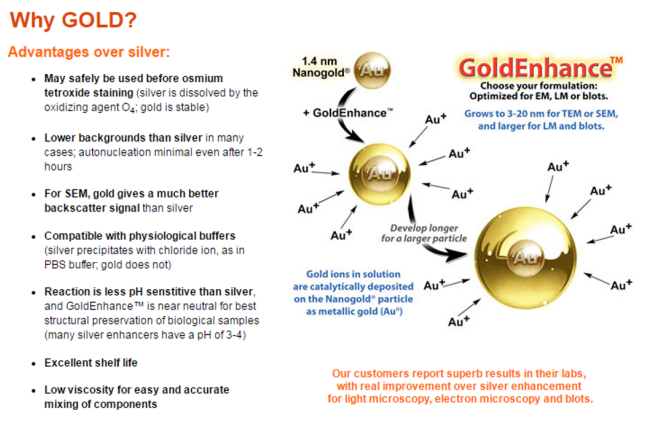 With GoldEnhance™, gold ions are specifically deposited around the gold nanoparticle, growing it in size, and offering several advantages over silver. For TEM, the 1.4 nm Nanogold® can be enlarged to 3-20 nm for clear visiblility, even at low magnifications. Using an initial small gold immunoprobe allows better penetration into tissues (up to 40 microns!) and better labeling of antigens. Then gold enhancement makes everything clearly visible. The development time can be extended to deposit more gold and make the signal visible by bright field (or reflection) light microscopy. With a little more development time, the signal can be seen by the naked eye, and can be used with dot blots or Westerns. Highest quality enhancer for Nanogold®, giving uniform development and excellent structural preservation. especially for EM; light sensitive. It is a new biological labelling and staining method developed at Nanoprobes. It uses a targeted enzymatic probe with a novel metallographic substrate to provide a quantum leap in staining clarity over conventional chromogenic and fluorescent substrates. 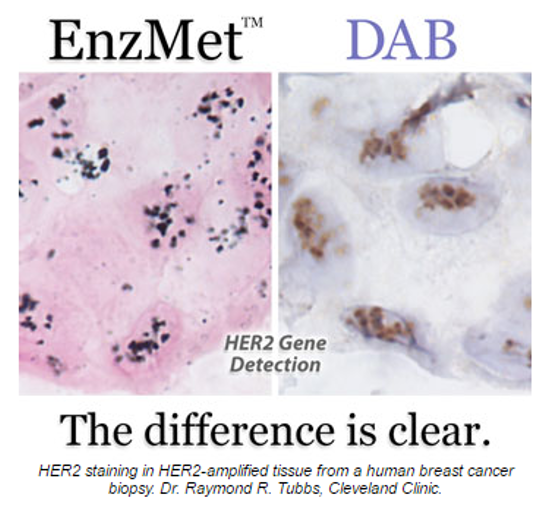 EnzMet™ has proven highly sensitive both for in situ hybridization (ISH), where it readily visualizes endogenous copies of single genes, and immunohistochemistry (IHC) detection. These nanoparticles are coated and stabilized using different thiol ligands capped by chemical groups which provide a variety of solubilities, and these gold nanomaterials are therefore suitable for a wide range of applications in different systems and environments. The octane- and dodecanethiol functionalized gold nanoparticles have great solubility in organic solvent such as toluene, while the hydrophilic (1-mercaptoundec-11-yl) tetraethyleneglycol functionalized gold nanoparticles dissolve in water and alcohols. The 1-mercapto-(triethyleneglycol) methyl ester functionalized gold nanoparticles are amphiphilic, dissolving in a wide variety of solvents including toluene, chloroform, ethyl acetate, acetone, water and alcohols. Product Code NP-3012. 1-Mercapto-(triethylene glycol) methyl ether functionalized 5 nm gold nanoparticles. The thiol is covalently attached to 5 nm gold nanoparticles. Soluble in a variety of solvents including toluene, chloroform, ethyl acetate, acetone, water and alcohols. Product Code NP-3013. (1-Mercaptoundec-11-yl) tetraethyleneglycol functionalized 5 nm gold nanoparticles. The thiol is covalently attached to 5 nm gold nanoparticles. Soluble in alcohol and water. Product Code: NP-3014. Dodecanethiol functionalized 5 nm gold nanoparticles. The thiol is covalently attached to 5 nm gold nanoparticles. Use in organic solvents such as toluene. The thiol is covalently attached to 3 nm gold nanoparticles. Use in organic solvents such as toluene. The 1.4 nm Nanogold® particle is a gold compound: it is not just adsorbed to proteins, like colloidal gold, but covalently reacts at specific sites under mild buffer conditions. This gives a well-defined product that can be purified chromatographically. Nanogold® brings the versatility of fluorescent conjugation to gold labelling. Label any molecule with a suitable reactive group: oligonucleotides, lipids, peptides, proteins, enzyme inhibitors and others.This is a big improvement over colloidal gold, which may be adsorbed only to antibodies and a limited range of proteins and peptides. Nanogold® is small and highly uniform in size, in sharp contrast to small colloidal gold preparations (most commonly used “1 nm” colloidal golds actually range from 1 to 3 nm). Biocompatible and Superparamagnetic: The latest line of nanoparticles are iron-based, yet carefully engineered for both biocompatibility and superparamagnetic properties- and heating in an alternating magnetic field. Does this get your imagination going? It sure does for us! The potential here is exciting, including nano-scale electronics, MRI contrast agents, cancer treatments with magnetic heating, and wide industrial applications. Our biocompatible magnetic nanoparticles are unique in the market - and a significant breakthrough in the pursuit of medical treatments of the future. NanoVan® - based on Vanadium. For Nanogold® or anywhere a low atomic number light stain is needed .